Par West Custom Golf Shoes are made to the exact dimensions of your feet. Individual molds are made by using a foam mold impression kit (1) with tracing & measuring each foot (2). The kit and instructions are sent via FedEx with a prepaid return address label enclosed. The first pair usually takes 8-10 weeks to deliver but once the custom molds of your feet are available (3) shoes can be ready in less than 4 weeks. Please call toll free 800-PAR WEST to order your fitting kit. Your custom golf shoes are guaranteed to fit correctly or we'll make whatever adjustments are necessary to keep our customers satisfied. Prices start at $750 but vary depending on the various skins used. The customer can design each style with any skin and color available. I believe the shoe is as important to the serious golfer as the club. The mind will not focus on the game at hand if the feet are not happy and without proper fit there is a loss of function (i.e. balance and stability which are the key to a consistent golf swing). That means the shoe must maintain its ability to stabilize your body weight while providing constant comfort. Large manufacturers today create a perceived fit and comfort by using foam fillers to adjust variations in the shoe sizes and widths. In order for them to fit the general population wearing a men’s size 9 medium width a specific size must fit 3 million customers. 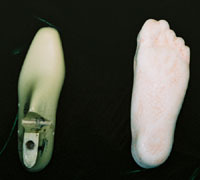 Eventually the foam filler breaks down inside the shoe and the foot starts to move as the body torques throughout the swing. Therefore, our first step in creating a custom golf shoe is to accurately measure the feet so that each shoe is made to the exact dimensions of the foot and there is no need for foam fillers inside. This is done by making an impression of both feet and also tracing each foot to take accurate measurements of specific areas in the toe, ball and instep. We then use these measurements to create your individual molds call a custom “last”. The custom lasts are kept at my factory so you can always order additional shoes in the future. I'll also ask for personal preferences as to the type of sock usually worn, if the shoes will be worn primarily for walking or riding, if you wear any orthotic insert and any feet abnormalities which may affect the fitting. I use Texon dual density EVA insoles designed to absorb heel shock and provide lasting comfort. The design process allows each customer to create a shoe in several styles, skins and colors. First pick a style, then choose from a wide variety of colors in exotic and fine leathers from around the world including; American Alligator, Caiman Crocodile, African Elephant, Ostrich, Sharkskin, Stingray, American Buffalo, Python, Eel , Lizard, Anteater, Calfskin and many others. Only the finest skins are selected for Par West shoes. Custom Color Match (CCM) tanning allows you to craft a one-of-a-kind pair of golf or dress shoes that compliment your wardrobe to a tee. No other shoe says so much about your personal style. While most golf shoes manufactured today seldom hold up more than a few seasons, Par West custom shoes are built to last a lifetime. Each pair is hand crafted at our factory and inspected for quality workmanship every step of the way. Specially treated leather outsoles are made to stand up to moisture and golf course chemical exposure. We use only American Bison hide in the linings which wear far better than conventional cowhide or manmade materials. The long life of a custom quality shoe assures you a value which pays for itself over time. Your complete satisfaction is unconditionally guaranteed.